The East Central District Soil and Crop Improvement Association moved the East Central Farm Show to the new Lindsay Fairgrounds in 2008. The Farm Show started in the Manvers Community Centre in 1981, became the East Central Farm Show and moved to the Fenelon Township Community Centre, Cambray in 1983 before moving to the Morrow building, Peterborough in 1992. 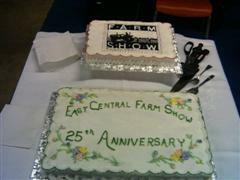 The 30th East Central Farm Show was held on March 3 and 4, 2010 in the Farmers’ Mutual Exhibition building at the Lindsay Fairgrounds. Over 150 exhibitors were present. The building now has 2 wireless sound speakers as the East Central Soil and Crop Association donated $5000 towards the sound system Fall 2010. Thanks to exhibitors who donated door prizes. 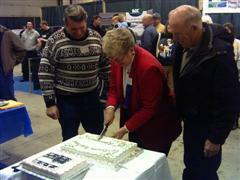 Getha Sherry cuts cake with Frank Hoftyzer and John Kinghorn looking on.